This morning I received a very lovely email from my friend and fellow HASTAC leader, Daniel Herwitz (director of the Humanities Institute at the University of Michigan). Daniel had just finished my book Now You See It. I'm touched by his taking the time to read the book and to send me a very positive, generous, appreciative comment, especially as Danny happens to be one of the smartest people I know. His opinion matters to me. And he did me the honor of not only saying kind things about the book, but of saying how much he would like a sustained conversation on the crucial topic (one of my favorites!) of attention. He's right. We cannot pay too much attention to attention. So here are some thoughts. Daniel was concerned that, in this world of emails and data and so much else, that we might be losing or diminishing the "long heritage in the humanities, and in culture (the arts) of mono-attention, the reader hermetically sealed in his monk’s library, translating, reading aloud, utterly focused, the modernist artist painting a monochrome canvas to be stared at for hours until “stray” associations disappear and the work sings in various mysterious registers, the line by line reading through of Ulysses, Pound, the pages of Wittgenstein, the endlessly repeated work of the gymnast in training, the skier at the slalom pole, the pool player trying for a new shot, the world of chess" (I told you he was one of the smartest people I know). He argues that this profoundly deep, introspective, solitary mode of attention deserves a "concept of attention" all its own. "Hi, Danny: The reason I don't want "multitasking" to be definitive is because that is such a shallow, impoverished understanding of how difficult and rare it is to be able to achieve (hey! even before the internet!) anything like true, sustained attention. My working title for the book was Katsu, the Buddhist concept of the thunderclap that turns a life around. In meditative practice, the good mentor watches and uses the bamboo switch when he notices the acolyte's attention wander while sitting zazen. And the great mentor slaps the acolyte's shoulder with a bamboo switch at exactly the point at which the acolyte believes he has reached full, undivided attention, the path on the Way. Believing you are paying 100% attention is the surest way never to reach Nirvana. In meditative practice, it is the moment at which you feel totally absorbed, focused, at one with the university (what Csikszentmihalyi would call "flow") that you are most in danger of missing what is really going on inside you and in the universe. Thinking you are paying total attention means you are missing essentials elsewhere. Needless to say, a trade book could not be allowed to end with such a big, philosophical, unusual, and non-Western meditation; the conclusion of an academic book can open up a big, new thought but, in trade, you have to "bring the argument home," end with a bang. So katsu was left on the cutting room floor, so to speak. I had to fight for the Howard Rheingold exercise "close your cell phones. close your laptop. now close your eyes" (I do that at the beginning of my classes now, by the way), andI was able to keep in my night-town walk through the Korean street market, and for the Japanese proverb "the reverse side itself has a reverse side." But katsu, I lost . . . I have a funny story. At one of my very first readings, at Chicago Public Library, a young researcher came up afterwards and was interested in my research on what causes traffic accidents. We sat for a while and talked about the ethnographies (also much truncated in the book) I'd done with magicians, advertising executives (that one stayed in), and insurance adjusters (now only a line or two). The insurance adjusters all said that people attributed accidents to "actual" causes but often there were lapses in attention---worry, illness, heart ache. This researcher and I then talked about what days of the year might be most stressful and we came up with a few, include tax day. This year on April 15, a statistical study (I assume he was part of the research team) was released: there are 6.3% more traffic fatalities on April 15 than any other day of the year except Super Bowl Sunday (well known for years as the most dangerous day of the year to drive--fatalities rise about 6% on that day). The theory was anxiety, anger, and the tedium of filing taxes on time are so preoccupying, and everyone has to do it, that people aren't paying attention to the road even if they think they are. We also began thinking about Super Bowl Sunday and it turns out alcohol plays a smaller part than anyone assumed--there are always DUI statistics with fatalities. My theory would be agitation over who won, who lost, arguments in cars going home, everyone in that state piling on to the road at once, all that. The "car fatality after the big game" is a well known phenomenon of insurance adjusters. The point: when we think we are paying attention, often we are not. We only track our lapses in attention when something calls them out to us. We don't even know we are distracted until either we end up in some kind of accident (from the stubbed toe to the car crash) or our distraction reaches such an annoying level that we become aware of it. (i.e. so many studies show that our mind is always wandering but we have no idea it is; even when we think we are focusing, we end up losing a train of thought or being interrupted by other thoughts all the time, without even tracking the waivering focus). That's why I say "distraction is our friend." When we feel distracted, then we have a rare chance to be introspective, to pause and look inward and ask what about our life (overwork? boredom? too much email? anger at one's boss?) or about the particular work situation (traffic? no window? bad air? noise? a cubicle? too much email?) is making us unable to focus. Often, if you can catch the moment of distraction, you catch your biggest insight and you miss it otherwise, if you don't stop to analyze what is making you distracted. Or as the monk would shout, "KATSU!" Daniel friend wrote back: "Exactly! Think Michigan in the hunting season. Yes, there is beer in the equation, but also an excess of aggressive focus right between the eyes." I cannot think of a better example of how attention blindness works. We think we are focused, we pull the trigger, and, way too often, we wing our hunting partner--or a cow that, in all that heat of focus, looked an awful lot like a deer. Distraction is our friend. If only we can use it as a diagnostic of all the things about ourselves that we often see because we're too obsessed with paying attention! Cathy N. Davidson is co-founder of HASTAC, a 9000+ network committed to new modes of collaboration, research, learning, and institutional change. Along with a steering committee of scholars across many fields, Davidson has been directing HASTAC's operations since 2006, when www.hastac.org moved to Duke University, where she also co-directs the Ph.D. Lab in Digital Knowledge. 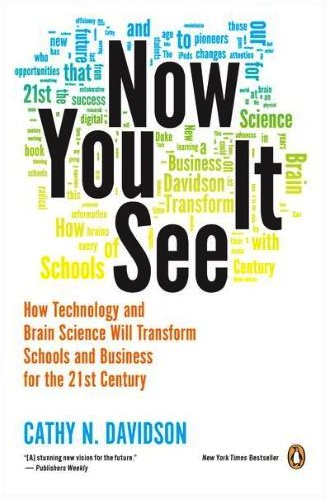 She is author of The Future of Thinking: Learning Institutions for a Digital Age (with HASTAC co-founder David Theo Goldberg), and Now You See It: How the Brain Science of Attention Will Transform the Way We Live, Work, and Learn (Viking Press). She is co-PI on the HASTAC/MacArthur Foundation Digital Media and Learning Competitions. NOTE: The views expressed in Cat in the Stack blogs and in NOW YOU SEE IT are solely those of the author and not of HASTAC, nor of any institution or organization. Davidson also writes on her own author blog, www.nowyouseeit.net .